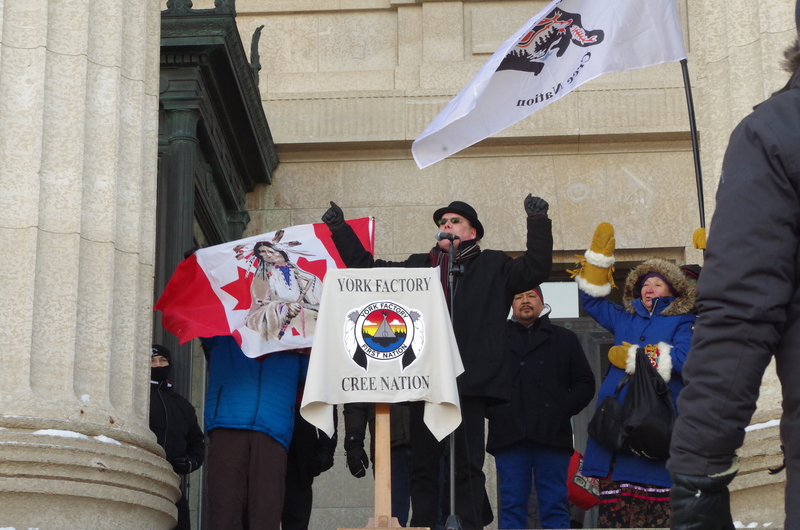 A rally at the Legislature in Winnipeg, Man. on Jan. 19 sought to raise awareness of the damaging impact on treaty lands in Northern Manitoba by Manitoba Hydro, and the mistreatment of Indigenous women. Muller spoke of crimes against Indigenous women taking place at the ‘man camps’, where Manitoba Hydro work crews have set up, stories of sexual violence and racism that have recently been uncovered. The company’s activities and development disproportionately impacts Indigenous peoples compared to the rest of society and it’s something that must “absolutely stop and it’s something that absolutely needs to be addressed,” he said. Muller questioned Prime Minister Justin Trudeau’s intentions for reconciliation with the First Nations, as well as with Canada’s climate action plan. “We need the people in charge to be accountable,” he said.